Alberni District Secondary School’s Wrestling Team finished third overall at the 2016 BC High School Championships in Abbotsford. Alberni District Secondary School’s Wrestling Team finished third overall at the 2016 BC High School Championships in Abbotsford on the weekend. The Armada finished behind Saint Thomas Moore of Burnaby and Pinetree of Coquitlam. There were 109 schools represented at this year’s BC High School Championships. In addition to the combined team standings the Armada boys team finished fifth in their division. “The most promising thing about our results this weekend is every single one of our wrestlers returns to ADSS next year,” head coach John McDonald said following the competition. There were a number of strong individual results that propelled the young ADSS team to their third place finish. Final individual results were: Aaron Badovinac (2nd 70kg), Ravi Manhas (3rd 41kg), Isaac McDonald (3rd 54kg), Kyla McAuley (3rd HWT), Morgan Dagenais (5th 57kg), Kiarra Fong (5th 54kg), Seth Price (5th 45kg), Trevor Barker (5th 48kg), Kylea Anderson (6th 90kg) and Owen Spencer (6th 51kg). 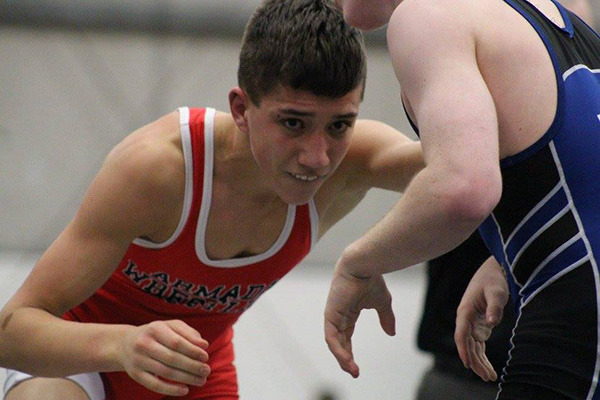 “Our wrestlers should be really proud of what they accomplished this weekend,” coach Chris Bodnar said. “Little Bado (Aaron Badovinac) wrestled really well. He pinned all three of his opponents to get into the gold medal final. In the final he came up against Brookswood’s Trevor Weltzin. Weltzin has been undefeated all year and is a returning national and provincial medallist. Bronze medallists Ravi Manhas, Isaac McDonald (pictured here), and Kyla McAuley all had great tournaments, losing only one close match respectively. “Ravi is a two-time bronze medallist at the BCs. He showed a lot of grit wrestling on the consolation side after a disappointing semi-final loss,” noted ADSS coach Russ Bodnar. Isaac McDonald garnered a lot of praise from opposing coaches for his performance in the 54-kilogram division at the BCs. “A bronze medal is certainly nothing to shake your head at but it doesn’t necessarily reflect just how good Isaac wrestled,” coach James Messenger said. Grade 9 athlete Kyla McAuley “wrestled the tournament of her life,” ADSS coach Jeannette Badovinac said. “She beat a girl who she has lost to three or four times this season. In fact she beat the gold medallist in the preliminaries but due to the tie breaking criteria in her division finished with the bronze,” Badovinac said. With the future looking so bright Alberni District Secondary School and the Alberni Valley Wrestling Club successfully put in a bid to host the BC High School Championships in 2018. The athletes and coaching staff are already looking forward to building on this year’s results in Salmon Arm 2017 and the opportunity to compete in front of the home crowd in 2018. The BC Championships officially wrap up the high school season. A handful of wrestlers have been invited to participate in training and competitive opportunities with Team BC over the next few months.